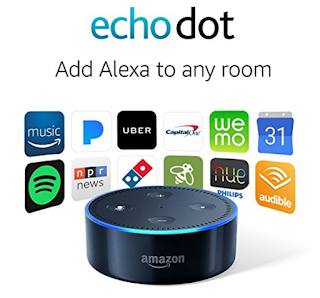 My Tampa Bay Mommy : *Prime Day Deal* Amazon Echo Dot Just $34.99 (Retail $49.99) Shipped! *Prime Day Deal* Amazon Echo Dot Just $34.99 (Retail $49.99) Shipped! Amazon Prime Members can get the Echo Dot for just $34.99 (Retail $49.99) shipped. Not sure how long this price will last, but if you've been thinking about one...now is your chance as this is the lowest price I have seen. We have a few and LOVE ours! It makes a great gift too for the tweens/teens, that can sometimes be hard to buy for. And don't forget to sign up for 4 months of Music Unlimited for just $0.99/mo - so awesome for summer playlists! -Introducing Alexa calling and messaging, a new way to be together with family and friends. Just ask Alexa to call or message anyone with an Echo, Echo Dot, or the Alexa App.